Taz weighs 4 1/2 pounds. I don’t know how many times people have asked me if my Yorkies are “teacup”, “toy”, “miniature”, or “standard” Yorkies. I have tried to explain to them that there is only one classification for Yorkshire Terriers. They are under the toy group but are listed only as Yorkshire Terrier. This is what your papers will show whether they are from the AKC, UKC, or CKC. 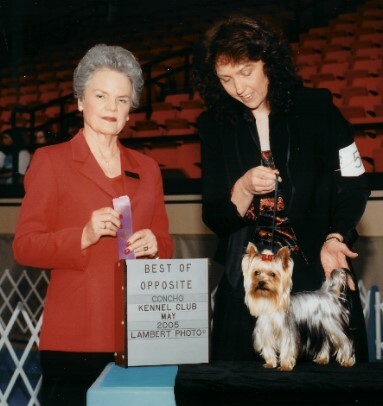 The breed standard for Yorkies according to the parent club "The Yorkshire Terrier Club of America" states that the "weight must not exceed seven pounds". This is the only statement made as to size of the Yorkie, so whether it grows to be seven pounds or one pound the dog is just a wonderful, beautiful Yorkie. When you call breeders that are advertising “Teacup Yorkies” you will find that the sizes are always different. Some will sell them as 2 to 3 pounds, others anything under 5, some even larger, but there is no standard guideline for them to follow. The reason for this type of advertisement can only be to try to convince people to buy their "teacup” over another breeders “standard” Yorkie, they have not researched and studied the breed that they are trying to sell, or they just don't care. It is understood by most breeders and buyers that the smaller dogs sell for a higher price, but this can be done without giving a false impression to the buyer. The breeder can simply notify the buyer of the estimated weight of the dog as an adult and the price they want for the puppy. I can tell you that the first litter that Sassie and Cujo parented ranged in size. One male at 4 1/2 pounds, one at 5 1/2 pounds, one female between 4 and 5 pounds, and last but definitely not least one male at 7 pounds. I kept one puppy from her second litter to breed thinking she would be 4 1/2 pounds and she weighs 3 pounds 13 oz. The point is they are all just wonderful, beautiful Yorkies.